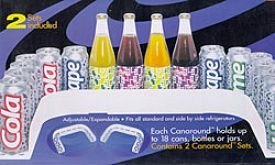 Can-Around makes use of every inch of storage space in your refrigerator! Can-Around’s two-unit system holds up to 36 cans, bottles or jars in an adjustable horseshoe-shaped design that fits along the sides and back of your fridge. Ideal for use in cabinets, too. Interlocking units expand to 29-¾" to fit any style fridge.